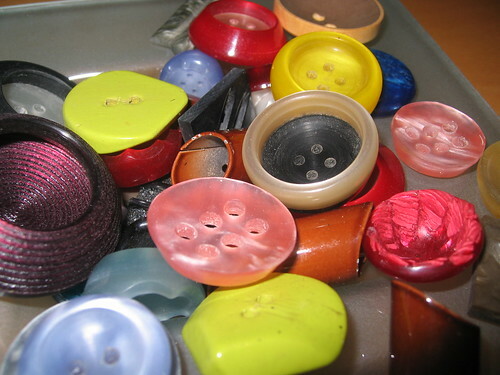 My lucky day… lots of vintage buttons for me!! Today I’ve been to my friend Nina’s workroom and we’ve spent the morning together. 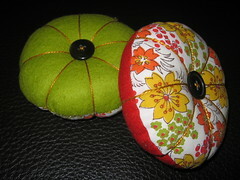 She has shown me some wonderful vintage brim blocks that she has gotten and perhaps next Monday we will give them a go. 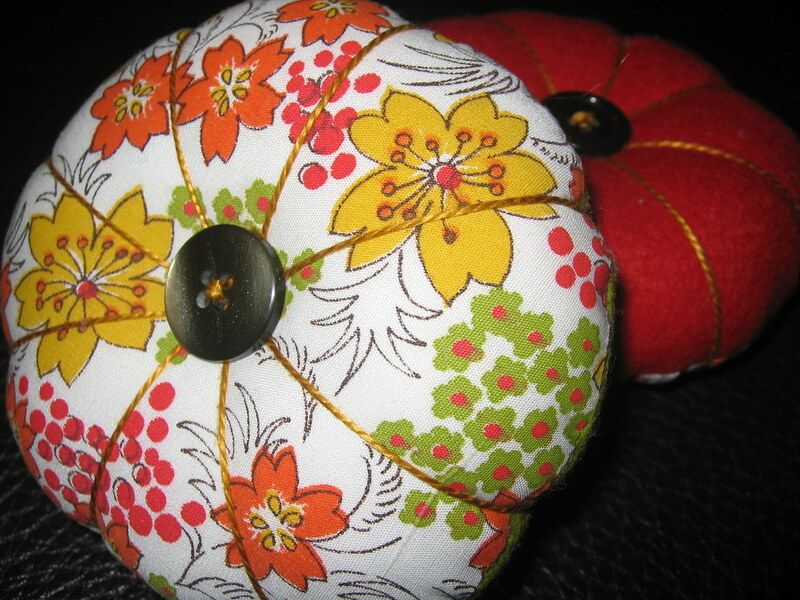 I have given her one of my pin cushions which I’m sure has found a good home with her (it’s the yellow one with a green button), and some of her vintage buttons have found a good home with me! Aren’t they just great?! 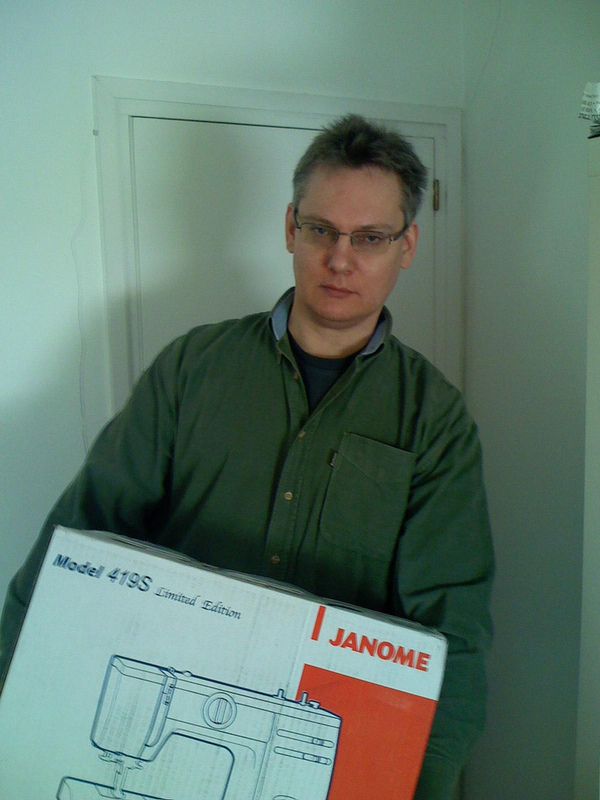 Now I have to think of a deserving project to use them on. You can check more pictures on this link. 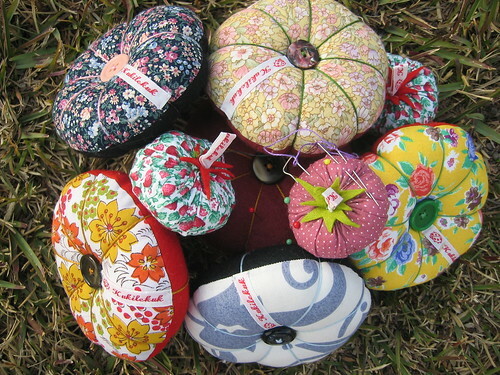 After the success of my first two pin cushions and due to public demand I’ve made a whole new bunch, here pictured (click on the image to see more pictures), some of which have already found a loving new home. 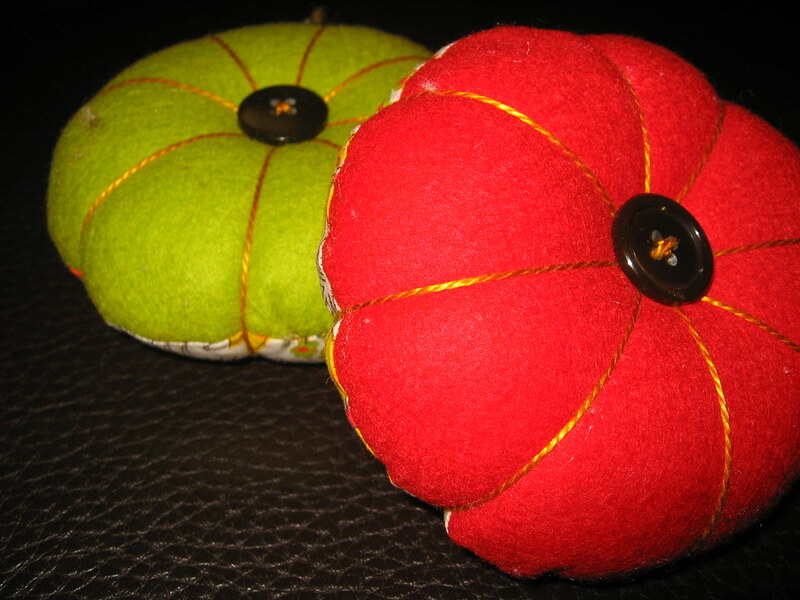 Before I give up on pincushions I will try a cute square one following this detailed tutorial from the blog Stephanie sews. 18-february-2008: I’ve included this post under the “sewing projects” category. I saw this wonderful tutorial on the internet for a super easy pin cushion and I could not resist. I’ve used a little scrap of vintage fabric that I found at my mom’s house which is nice and colorful. 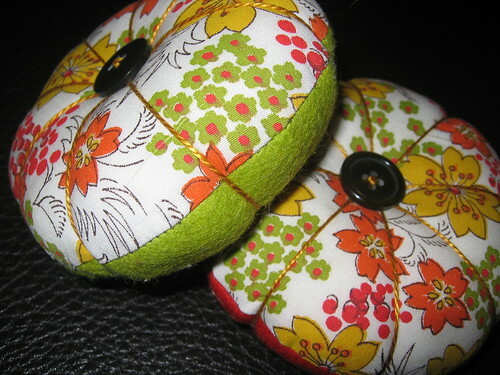 I wish I had found nicer buttons, but even so the pin cushions look nice (probably not so if you look too closely!). I also want to tell you about my cheap but chic woven labels that I’ve ordered for my little projects (these are not for the hats). I almost forgot to sew them in! They are actually “school labels” and cost below 8 euros (less than 12 USD) for 72 labels (includding shipping). I’ve always liked ladybugs and that being one of the drawings available I thought it would be fun. Check out the labels on the blog of my cousin, just perfect for her knitting projects. I made an apron with my new sewing machine! 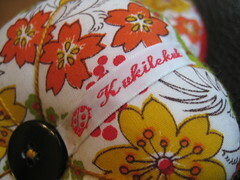 I’ve been learning how to use my sewing machine (I’m really happy with it!). For those who know how to sew it must seem ridiculous that I’m so excited about making a simple apron, but I’m awfully proud. 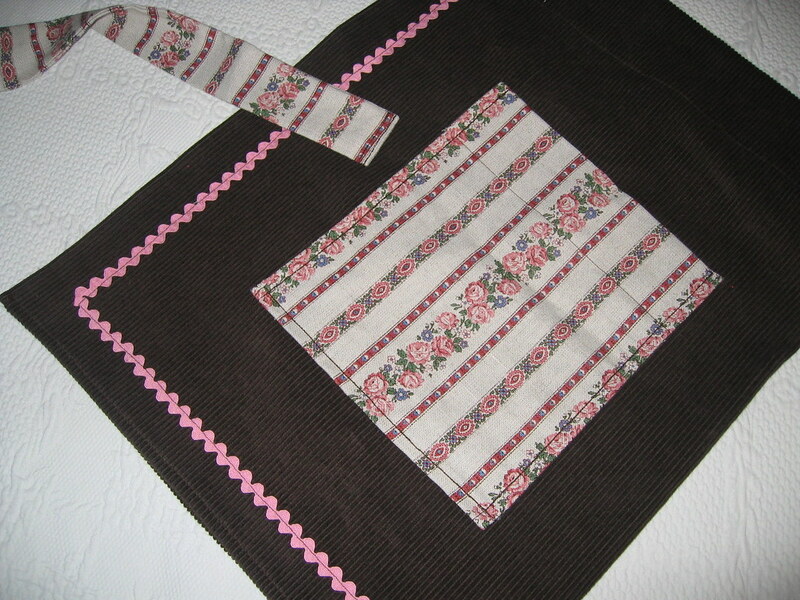 To avoid complications I have made a simple thing without using a pattern, just a rectangle of brown corduroy, pink rick-rack edge and then pockets and tie made out of a thick cotton/linen fabric that I had stashed away. Yesterday was “three wise men” day. In Spain that is the day when children (and adults) get their Christmas gifts. The three wise men come from the orient in ther camels loaded with gifts. My apron was a gift for Helena, my brother Jose Manuel’s girlfriend, and she liked it a lot and inmediately tried it on. My mom, said that she wanted one herself, so I’m working on that now (the Homburg, almost finished, is not forgotten!). 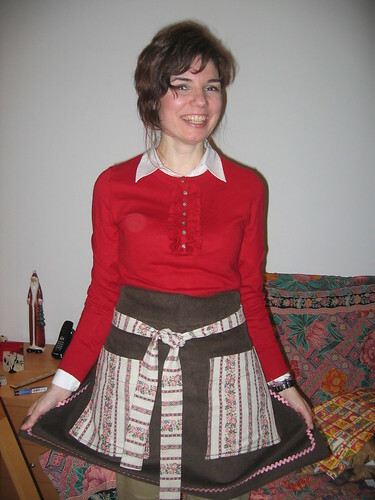 While looking at Amy Carol’s blog called angry chicken I saw that there’s a flickr group dedicated to old apron patterns. Will you believe that?! 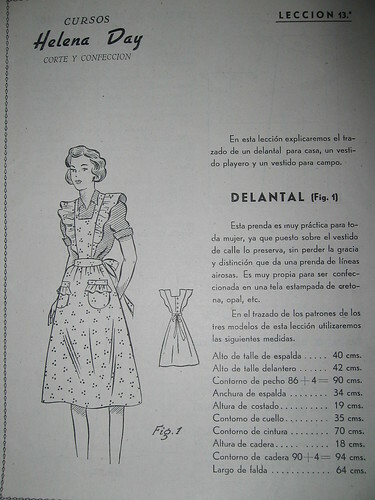 There you will find hundreds of pictures and scans of old apron patterns. Should come as no surprise that there are lots of people out there who love and make aprons, but the truth is that it doesn’t cease to amaze me the amount of great things and great people you can meet on the internet. This pattern comes from a Spanish mail order sewing course dating from the 1950’s.